Dota 2 is one of the most widely acclaimed video games on the market. Media publications hail the game’s quality production elements and the rewarding gaming experience. In the game, two five-player teams defend a base. Each player is a unique character, called a hero. The hero’s playing style and abilities help to overcome the enemy. During a game, the players collect points and items, but a team can only win by destroying the “Ancient” structure on another base. The complex game is immensely popular on the Steam gaming platform. At one point, the game had more than one million simultaneous players. 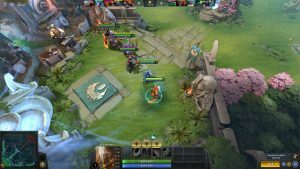 While Dota 2 is free-to-play, revenue comes from costs within the game, called microtransactions. Purchasing a virtual item will help the player’s game. For instance, players may obtain avatar customization, armor, or weapons. Since its release, the game has added virtual reality support, making it even more attractive to avid gamers. In 2011, Valve, the game developer, produced and promoted a tournament. It was the first of its kind for Dota 2. The tournament’s success inspired a yearly event, called The International. The organizers fund the events with crowdfunding money. In 2018, the prize amount surpassed $25 million. By 2017, professional players and teams had earned more than $100 million. These gamer earnings eclipse all other e-sport games in tournament winnings. The game’s popularity attracts international television coverage on ESPN, BBC, and other stations in around the globe. Some Dota 2 events stream live via Twitch.tv, a video streaming platform. With a worldwide following, the game continues to break records and receive awards. In 2013, Dota 2 received an award and recognition from PCGamer magazine. In 2017, the Teen Choice Awards also recognized Dota 2. There’s no sign that the game’s popularity is waning, as millions of users continue to play internationally.